TEPCO to Redefine Its Idea of "Criticality"
She says that they got sick and they had to quit. But that was after they were berated by their superior as "unpatriotic". Her friend died in 3 months after having been found with internal radiation exposure. In July, he was found to have been internally exposed to radiation. All his team members had been, too. But their mission didn't end. Rescue people are those who went through very hard training and have a strong will to do something for the sake of others. So they continued to carry out their mission, even though they knew they had been exposed to radiation. Eventually they got sick and realized they couldn't continue their duties any more. All the team members including him quit the rescue squad. Before they quit, they had been condemned by their supervisors as unpatriotic. Those people who are in charge of debris disposal or something like that...Can't they do it safely? I just don't understand why people who serve us have to lose their lives like this. But we can't do it by ourselves, can we? What do you think? This is what I wanted to ask you. Maybe difficult...Simply...you know, simply generating electricity exposes workers to radiation. They have to enter various places for maintenance work and all. Nuclear power makes up less than 30% of our whole electricity generation, sacrificing the health of such people. I wonder what it is for. Why won't they abandon it when other methods can compensate for its absence? Even when such a terrible disaster occurred? After all, it's clear that they do nothing to take care of the aftermath. Nothing. Neither TEPCO nor the government. That's why nuclear electricity is said to be cheap. Of course it's cheap, because they do nothing even when a worst-case scenario happens. Doing nothing costs nothing. Doctor...excuse me, Dr. Sakiyama, is it difficult for those people who touch debris or other radioactive things to work safely? You don't need to stand up, please remain seated. Well, if they wore something like space suits, they might be protected. But then they wouldn't be able to move around to do the work. It's not just a problem for people in charge of debris disposal, but also for workers at the site of Fukushima-1 plant. As you know, their exposure limit has been raised from the original 100 millisievert to 250. Without their efforts, nobody knows what will become of the plant. We depend upon them, heavily. And even when there is no accident, nuke plants are only made possible by their labor that involves radiation exposure. Dr. Koide often refers to it as "built on the structure of discrimination." We have been wrong in letting it be this way for a long time. Now I'm really not sure what to do. Dr. Sakiyama cunningly switched the subject to the Fukushima plant workers, but the issue here is not the plant workers. It's the rescue squad members, it's the volunteers, it's the residents, who have been exposed, willing or not, to radiation that could kill over time, and who are without any shred of safeguard for their health. If they die, it is because of "stress". But at least she candidly admits that she doesn't know what to do. J-Village is located just inside the 20 kilometer radius from Fukushima I Nuclear Power Plant, and is the staging area for the plant work. Ordinary citizens cannot even enter (it is a "no entry" zone). The following are the actual air radiation measurements on the Ekiden course from the blog posts (here and here) of a TV writer who calls himself "Chidai", on November 12. He measured the air radiation levels at 1 meter off the ground on the Ekiden course. Now the Ekiden course in Fukushima City. There are many more locations that registered even higher radiation. He also says that when he measured at 5 centimeters off the ground, the radiation levels jumped everywhere. The writer is sorry that he couldn't have the event canceled. He is asking "What are we doing? Is this the "recovery" we want for Fukushima? Are we human, to allow this to happen? " Shame on the city. Shame on the athletic association and the corporate sponsors. And shame on the parents of these girls for being so willing to risk their daughters' health for... For what? Back in September, I wrote a post about the 27th East Japan Women's "Ekiden" Road Race to be held in Fukushima City, featuring underage girls as young as 13. The race is on, this Sunday, November 13. Since I wrote the post, there has been a slow but now rapidly growing attempt from concerned citizens to stop the event. Short of stopping, at least they want emergency decontamination. Why? 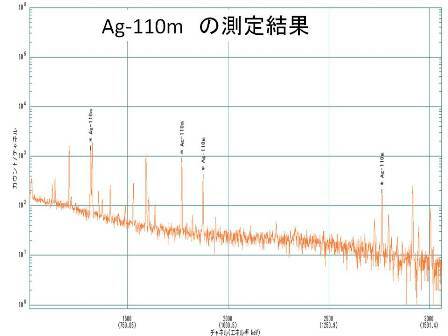 Because the radiation levels in the stadium and on the roads to be used in the race in Fukushima City is very, very high, as they are being measured measured right now by a citizens group HCR+OPCOM. This is only for the 1st segment of the race course, and I assume they are only measuring gamma rays. Judging from the photos they post, they are measuring at the side of the road where the sediment and small debris tend to accumulate. Still, now we know that the asphalt and concrete cannot be effectively "decontaminated" at this point, maybe there is not much difference. Fukushima City is where Greenpeace found cobalt-60 in the soil in a park. Willful ignorance of the coaches of these girls, particularly those school coaches who are also teachers, is staggering. They think it is totally safe, because "if it isn't, they wouldn't have planned it". That's similar to the Mayor of Yokohama, who said the food was safe "if it was sold in the market". As related in one tweet, one of the coaches/teachers replied to the concern of a parent that there was this thing called "half life", and the radiation level in Fukushima City had already fallen to a safe level. Half life of cesium-137 is 30 years. I guess no one had told that teacher about it. When the parent told him about it and how high the radiation level in Fukushima City was, the coach got really concerned. Every participating team has girls in high school and junior high school. I believe it is a requirement. It looks more than half of the members in any given are made up of girls under the age of 18. They are not even a voting age or drinking age (age of 20). One quarter of the team members cannot marry even with the consent of their parents (age of 16). But they can be exposed to high radiation. Does that make sense? I thought intentionally endangering the minor is a crime. IAEA's press release mentions only Czech Republic and other areas in Europe. According to NHK News (11/12/2011), CTBTO says Russia, Sweden, and Austria. NHK adds Hungary and Germany. IAEA says it is probably not from a nuclear power plant accident, and it is not from Fukushima, and it doesn't affect health because the amount is minute. If CTBTO stations have been catching it, iodine-131 is airborne; you can't say someone treated for thyroid illness is peeing. Radioactive iodine-131 does not exist in nature. It is caused by nuclear fission of materials like uranium. When a serious accident happens in a nuclear facility, iodine-131 may be released into the environment. In the Chernobyl nuclear plant accident that took place in the former Soviet Union, a large amount of iodine-131 was released, causing grave health damage to the residents who were exposed to the nuclide. Iodine-131 was released in the Fukushima I Nuclear Power Plant accident. Iodine-131 is also used in the medical purposes like diagnosis and treatment. Hospitals, laboratories and corporations are responsible for the safe management of the radioactive materials including iodine-131 for medical and research purposes, there are cases reported of inappropriate management. ... meaning some hospital, lab, or manufacturer has been releasing iodine-131 by accident or by neglect, according to the insinuation of IAEA and NHK. Well, there was an earthquake that hit Turkey on October 23. There was a report/rumor on the Iranian state radio in Japanese that the "most dangerous in the world" Metsamor Nuclear Power Plant in Armenia was damaged in the earthquake. 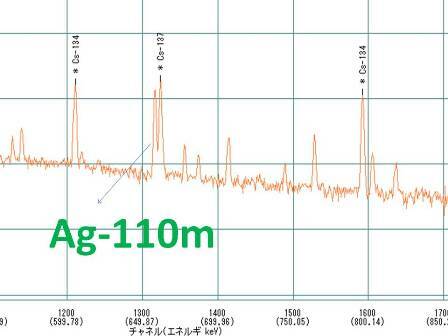 But if the CTBTO station in Austria started detecting iodine-131 on October 17 (1 nanosievert/hour max, 1/100 of the level seen after the Fukushima accident), the Armenian plant cannot be it. The IAEA has received information from the State Office for Nuclear Safety of the Czech Republic that very low levels of iodine-131 have been measured in the atmosphere over the Czech Republic in recent days. Like governor (the one who went crazy over radioactive tea in his prefecture and who was so ready to restart Hamaoka Nuke Plant in late March), like mayors. Sorry residents. The Association of City Mayors in Shizuoka Prefecture (Chairman Hisashi Suzuki, Mayor of Fuji City) and the Association of Town/Village Mayors (Chairman Hideo Endo, Mayor of Nagaizumi-cho) compiled the joint declaration on November 10 to accept debris from the disaster-affected areas. According to the Japan Association of City Mayors, "The declaration by the Association of City Mayors anywhere to accept disaster debris is unheard of." Heita Kawakatsu, governor of Shizuoka Prefecture, requested the mayors to come up with some plan, as the governor felt the problem as his own. 35 mayors got together to discuss, and came up with the declaration to cooperate depending on the situation in each city/town/village after ensuring 1) the debris is safe; 2) the residents agree; 3) city assemblies agree. Looking at Tokyo, (1) can be rigged, (2) and (3) can be easily ignored. They are burning away those debris and burying them in the landfill in Tokyo Bay, every single day. from the hydrogen gas that came from Reactor 3 when they did the vent of Reactor 3. TEPCO says in the handout for the press on November 10 that the gas, instead of going up the exhaust stack (oh no here we go again, the stack...) into the air, went to Reactor 4's air duct on the 4th floor. To prove their case, TEPCO released the photographs on November 10 taken on the 3rd, 4th, and 5th floors of Reactor 4 on November 8. The heaviest damage is on the 4th floor with totally destroyed and disfigured air duct pipes. The rebar of the floor of the 5th floor is lifted upwards, while the floor of the 4th floor is pushed downward. It seems plausible enough that an explosion (there may be more than one, judging by the number of "fires" that Reactor had on March 15 and 16) took place on the 4th floor. Photographs taken inside Reactor 4 before were rather neat and orderly. But this set of photographs shows the inside to be just as badly destroyed as Reactor 3. Or for that matter, as the top floor of Reactor 1 as seen in the video I posted before. For the complete set of photos, go to TEPCO's "Photos for Press" page, here. TEPCO did the vent of Reactor 3 at 9:20AM on March 13. The hydrogen gas supposed to have flowed into Reactor 4 through the air duct, to the 4th floor. Reactor 3 blew up at 11:01AM on March 14. The duct connecting Reactor 3 to the exhaust stack (shared by Reactors 3 and 4) was destroyed in the explosion and disconnected from the stack. After nearly 2 days after the hydrogen gas from Reactor 3, as the result of the vent, had filled the air duct on the 4th floor of Reactor 4, Reactor 4 had a hydrogen explosion at 6:12AM on March 15. Why did the hydrogen gas from Reactor 3 go to Reactor 4 to begin with, instead of out to the stack and into the atmosphere? Why didn't Reactor 4 blow up when Reactor 3 did, if it was filled with hydrogen gas? Instead, it waited another day till it finally blew. It does look like a hydrogen explosion, as I don't see any evidence of high temperature. The Spent Fuel Pool of Reactor 4 looks pretty much intact. and plutonium oxidized, turning into power. The cladding was made of stainless steel. One worker tested positive for americium-241 in the lungs, which is taken as a sure sign that he has inhaled plutonium. Early Tuesday afternoon, workers wearing lab coats and gloves but not respiratory gear were recovering the fuel so it could be shipped to a U.S. Department of Energy facility in an undisclosed state. The lab originally reported it was bound for Nevada but later retracted the statement. Lab officials suspect the stainless steel cladding that surrounded the plutonium was damaged years ago, beginning a slow-but-steady process of plutonium oxidation that led to the exposure. When workers opened an aluminum box that housed the fuel plates and cut away plastic wrapping, they noticed several grains of powder that escaped. "At that point, the job was suspended. The personnel exited the area," said Phil Breidenbach, nuclear operations director of the Materials and Fuel Complex, where the accident occurred. "However, as they were exiting, a constant air monitor went off, indicating contamination had gotten into the air," he said. "When they exited the area to their prearranged safe zone, they started surveying the individuals and found contamination." The person who posted the 7.356 microsieverts/hour spot at the gate post in front of a high-rise apartment in Setagaya-ku has an update. He says when the measurement was done again with the Setagaya-ku government people on the same spot, only his survey meter, HORIBA Radi PA-1000 , responded. The Setagaya-ku government used "NHC7" made by Fuji Electric. Their temporary conclusion is that for some reason the HORIBA Radi PA-1000 was picking up some electrical source inside the gate post. Burning, incinerating, and dumping in landfills - no, it's not about radioactive debris in Tokyo. The Dover Air Force Base mortuary for years disposed of portions of troops’ remains by cremating them and dumping the ashes in a Virginia landfill, a practice that officials have since abandoned in favor of burial at sea. The Dover, Del., mortuary, the main point of entry for the nation’s war dead and the target of federal investigations of alleged mishandling of remains, engaged in the practice from 2003 to 2008, according to Air Force officials. The manner of disposal was not disclosed to relatives of fallen service members. Air Force officials acknowledged the practice Wednesday in response to inquiries from The Washington Post. They said the procedure was limited to fragments or portions of body parts that were unable to be identified at first or were later recovered from the battlefield, and which family members had said could be disposed of by the military. Lt. Gen. Darrell G. Jones, the Air Force’s deputy chief for personnel, said the body parts were cremated, then incinerated, and then taken to a landfill by a military contractor. He likened the procedure to the disposal of medical waste. Jones also could not estimate how many body parts were handled in this way. “That was the common practice at the time, and since then our practices have improved,” he said. Gari-Lynn Smith, portions of whose husband’s remains were disposed of in the landfill after his 2006 death in Iraq, said she was “appalled and disgusted” by the way the Air Force had acted. She learned of the landfill disposal earlier this spring in a letter from a senior official at the Dover mortuary. An Air Force document shows that the landfill is in King George County, Va. Officials with Waste Management Inc., which operates the landfill, said the company was not informed about the origin of the ashes. “We were not specifically made aware of that process by the Air Force,” said Lisa Kardell, a spokeswoman for the company. The Dover mortuary changed its policy in June 2008, Jones said. Since then, the Navy has placed the cremated remains of body parts in urns that are buried at sea. 1 hour ago on Twitter, from someone who actually measured it with his HORIBA Radi PA-1000. It seems he has already notified the city hall. In his later tweets, he identifies the location as the front entrance of a high rise apartment building ("mansion" in Japanese). This one. The Swiss National TV aired the program in French on the Fukushima accident, with a focus on Yokohama City's response (or lack thereof) to the radioactive contamination in the city. The Mayor of Yokohama and 17 of the Assemblymen are on their trip to visit Frankfurt, Germany to play football (soccer) and then off to see the world. I would suggest to the citizens of Yokohama not to allow them back in. Please feel free to translate what they are saying in the video into English, and let me know. I can vaguely guess, but my French is worse than my German which is not good to begin with. By the way in Yokohama, schools and kindergartens continue merrily on their autumnal event of picking fallen leaves and burning them in a pile to roast sweet potatoes (triple horrors). On top of that, some schools are going to make pupils clean the park. At this point, cleaning the park means decontaminating the park. It seems Japan's Ministry of Foreign Affairs is planning to use produce from Fukushima in the receptions to be held in Japan's embassies around the world for the emperor's birthday in December. That's understandable, considering the IAEA chief is a former bureaucrat of the Ministry. But foreigners are avoiding Japanese restaurants. What are they thinking? The rumor says they will import [food from Fukushima] using the diplomatic immunity. In later tweets, he says he personally knows the embassy people in charge, who are ashamed of the Ministry's plan. He is most likely to attend the reception, as he has attended every year, he says, and will report. Well, the Ministry of Foreign Affairs is going to squander 1.1 billion yen inviting foreigners to Fukushima, Miyagi and Iwate so that they can tweet "favorably". Serving Fukushima vegetables and meat to dignitaries at Japan's embassies around the world so that foreigners think "favorably" of Japan and Fukushima in particular is just as demented, therefore totally in line with their (lack of) thinking. The Japanese government has dispatched the imperial family to disaster areas including high-radiation Fukushima City in April and May. They had the crown prince's family spend summer in high-radiation Nasu, Tochigi Prefecture. Now, they may use the emperor's birthday to force foreigners to eat Fukushima food. Are there any readers here who are regularly invited to the Japanese embassy events? The emperor's birthday is December 23. No leak of radiation outside the facility, says the lab. Plutonium is from the spent fuel. At least six workers were contaminated by low-level plutonium radiation and 11 others were exposed on Tuesday at a U.S. nuclear research lab in Idaho, but the public was not at risk, the government said. The accident at the Idaho National Laboratory occurred inside a deactivated reactor housed in a facility used for remotely handling, processing and examining spent nuclear fuel, radioactive waste and other irradiated materials, the lab said in a series of statements. The so-called Materials and Fuels Complex is located near the edge of the U.S. Energy Department's sprawling 890-square-mile laboratory site in the high desert in eastern Idaho about 38 miles from the city of Idaho Falls. But lab bulletins on the mishap, believed to be the most serious accident at the site in at least four years, said there was no evidence of a release of radiation outside the facility, and "there is no risk to the public or environment." A total of 17 technicians, all employees of lab contractor Battelle Energy Alliance, were working inside the decommissioned research reactor when "a container was opened for normal, scheduled work, resulting in low-level worker exposure to plutonium," the statements said. There were no immediate details from the lab on the precise cause or nature of the radiation release, such as whether it resulted from an equipment malfunction or human error. Lab spokesman Earl Johnson told Reuters the exposed workers were engaged in an activity and in an area that required no special protective shielding. "We certainly didn't expect this to happen," he said, adding that radiation-control technicians monitoring the area detected the low-level release. For your own copy, go to TEPCO's "Photos for Press" page. Yukio Edano Rewriting History: "I Said 'No Immediate Effect' Only 7 Times Out of 39!" Yukio Edano, who as the Chief Cabinet Secretary (mouthpiece) in the Kan Administration appeared several times a day during the early days of the Fukushima nuke crisis to soothe and reassure the general public that everything was under the government control and that there was nothing to worry about, now says he only used the famous "No immediate effect on health" only 7 times in the press conferences which he says there were 39. He is a lawyer by training, by the way. I held 39 press conferences during the first two weeks of March 11. Of those 39, I said "There is no immediate damage to the body or the health" 7 times. Of those 7, I referred to food and drinks 5 times. I wasn't talking about the generalities and did not say there was no immediate effect. I simply said, repeatedly, that there was a standard set so that if one drank milk for one year that had radioactive materials in it there would be a damage to the health, and that there would be no immediate problem if one consumed such drink once or twice. Clearly, Edano thinks everyone except himself is so dumb and forgetful that he can get away with it. First, even if it was only 7 times that he said "no immediate effect, or damage", that was amplified by several orders of magnitude by the media and by the government experts who were on TV, radio, almost 24/7 in the early days. Second, he most definitely did not say that the provisional safety standards were set so that if one consumed contaminated food or drink for one year there would be negative effects. He is now saying, "Oh didn't I tell you that? That was what the provisional safety limits were for, and I thought that was obvious to everyone, no?" Third, he certainly did not say "once or twice" when he talked about the provisional safety limits. The experts that the government sent to TV stations in the early days did their best in propagating variations of Edano's "no effect" message, reassuring the general public. Edano's excuse? "The government did not have detailed information on radiation levels." Eventually the areas northwest of the plant turned out to have high radiation levels. Regarding the high radiation levels in these areas, all I said was that they were not the levels of radiation that would affect [the health, or the body] in a short period of time; I didn't say [or mean] staying there long-term [and no effect]. Therefore, the radiation monitoring in the areas must be strengthened in order to confirm whether it would be OK to live there long-term, that's what I said. Eventually?? That's a lie right off the bat. The national government, and the Fukushima prefectural government, knew from the very early days that the radiation coming out of Fukushima I Nuke Plant was significant, particularly in the northwest of the plant (they detected tellurium in the morning of March 12 in Namie-machi, for one) and they were well aware that the core meltdown may have happened, as Goshi Hosono, current Minister in charge of nuclear accident and then-PM assistant, openly admitted on TV (and no one said anything, and he was rewarded with minister job). Asahi Shinbun's "Trap of Prometeus" (translated posts by following the link) relates how different government agencies and the Self Defense Force were measuring, without telling the residents, the radiation levels all over Fukushima; in Namie-machi, the air radiation was over 100 microsieverts/hour, and the government, and certainly the spokesman Edano knew full well. If he meant "short period of time", he certainly did not say that, and people continued to live in the areas, assured by his words and the words of the experts like Dr. Yamashita and his sidekick Dr. Takamura, who told the villagers in Iitate-mura that there was nothing to worry about and they could continue to live there with no problem. But the LDP politician simply moved on in the Q&A, instead of pressing Edano on the issue. If you understand Japanese, you can watch the Youtube video here. Dr. Bin Mori is a professor emeritus at University of Tokyo, Faculty of Agriculture. Since the beginning of the Fukushima nuclear crisis on March 11, the professor has been writing his blog focusing on the effect of radiation in plants and remediation of agricultural land. I have featured his autoradiographs of dandelion and horsetail on my blog before. In his post on October 30, Professor Mori wrote about his discovery, probably the world first, he made in spiders (Nephila clavata) he caught in Iitate-mura, Fukushima Prefecture, where the villagers were forced to evacuate after being designated as "planned evacuation zone". The spiders, he found, had radioactive silver (Ag-110m) at 1,000 times the concentration in the environment. Since it was difficult to collect plants in the rain in Iitate-mura, I caught instead "nephila clavatas" in the bamboo groves and cedar forest. I don't know whether the spiders eat dirt itself, but I thought they may have concentrated radioactive cesium in their bodies as they were at the top of the food chain in the forest, eating butterflies, horseflies, and drone beetles that they caught in their webs. I put 4 nephila cravatas together in the germanium semiconductor detector, and analyzed radioactive cesium (Cs-137 and Cs-134) (Picture 1). Then I noticed an unknown energy peak at 657.8keV, right next to the energy peak of Cs-137 at 661.7keV (Chart 2). When I identified this peak, it turned out to be one of the 4 gamma-ray peaks from Ag-110m (nuclear isomer of silver, half life 249.5 days). The other 3 peaks were also detected (Chart 3). 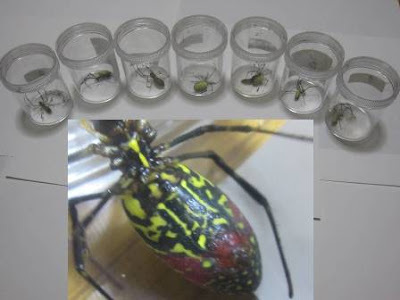 So, the conclusion is that nephila clavatas have concentrated a minute amount of radioactive silver (Ag-110m), which is one of the radioactive fallout materials from Fukushima I Nuclear Power Plant. In the forest where the spiders were caught, the ratio of radioactive cesium (134+137) to Ag-110m was about 2,500 to 1. Using the above numbers, I calculated that nephila clavatas bio-concentrated the radioactive silver in the soil to about 1,000 times. This is the first discovery in the world that an insect highly concentrates silver. Also, it is evident that bio-concentration of radioactivity in the forest has already started. I will present the details of my research on Saturday November 26 at the Japanese Society of Science and Plant Nutrition's Kanto Branch meeting (Faculty of Horticulture at Chiba University in Matsudo City, Chiba). Please come. Appendix: I'd like to thank Keitaro Tanoi of University of Tokyo Graduate School of Agricultural and Life Sciences for the measurement. PS: The definition of bio-concentration used here is calculated from the ratio to radioactive cesium. I won't discuss it in details here, but depending on how bio-concentration of radioactive cesium is defined, the concentration ratio of radioactive silver by nephila clavata may be even higher. Professor Mori says he is planning to write up the paper on the subject in English and submit it, but he says that's secondary. The most important thing, he says, is to disseminate information as wide as possible when it comes to radiation contamination, and he uses his blog to post his own unique discovery like this even before he writes it up as a scientific paper. On November 6, TEPCO disclosed its policy to review the standard to determine whether criticality has happened at Fukushima I Nuclear Power Plant. The report the company submitted to the Nuclear and Industrial Safety Agency under the Ministry of Economy, Trade and Industry defined the condition of criticality as whether noble gas with short half life was detected. However, radioactive xenon was detected in Reactor 2 on November 2, which is thought to have been created by spontaneous fission. TEPCO's definition didn't match the actual situation, and the company has no choice but redefine what it considers "criticality". When xenon was detected on November 2, TEPCO announced "There is a possibility of criticality". However, the company corrected it as "spontaneous fission" partly because the amount of xenon detected was small. TEPCO's general manager Kawamata said in the press conference on November 6, "We're sorry we've had you worried over whether re-criticality happened or not. We are preparing the revised report, and we will elaborate on our view in that report." In the report submitted to the NISA on October 17 on ensuring security in medium-term, the standard to judge the occurrence of criticality was the presence or absence of noble gas with short half life, such as xenon. If this is true, then whoever crafted the October report to the NISA didn't know how xenon is apparently generated in spontaneous fission inside a normal reactor; and TEPCO has been operating this nuke plant for almost 40 years. #Fukushima I Nuke Plant Xenon Detection Announcement: "Wag the Dog"? The Nuclear and Industrial Safety Agency (NISA) has now concurred (Yomiuri Shinbun 11/7/2011) with TEPCO's conclusion that it was just ordinary spontaneous fission, not re-criticality, which generated xenon gas in Reactor 2 of Fukushima I Nuclear Power Plant. Here's a view from the supposed insider, the worker who tweets from Fukushima I Nuclear Power Plant who seems to work for one of the top-tier subcontractors. He wonders why TEPCO announced the xenon detection when it did and strongly hinted that it was from re-criticality. I wonder the same thing, particularly when krypton-85 and xenon-131m were detected in even greater amounts in Reactor 2 Containment Vessel back in August. Xenon from spontaneous fission is routinely detected in the regular maintenance. TEPCO normally make announcements after exhausting all possibilities. They provide information to the government and the NISA in a timely manner. But when it comes to announcing to the public in the press conference, they would always investigate thoroughly before announcing. But yesterday, they shocked the public with the word "re-criticality" which TEPCO would never want to use. And today they are saying don't worry it is just spontaneous fission? In the yesterday's press conference [when they hinted re-criticality] it seemed like it would take long time to investigate, increasing the sampling. As they would do in normal circumstance. By the way, Minister Hosono [in charge of nuclear accident] was at the Fuku-1 plant yesterday but it was not reported in the media. What event happened yesterday which they wanted to cover up with even more sensational news [like "re-criticality" at Fukushima I Nuke Plant]? What did they want to manipulate? Could it be the restart of Genkai Nuclear Power Plant? Reactor 4 of Genkai Nuclear Power Plant in Saga Prefecture, which is operated by the scandal-ridden Kyushu Electric, restarted on November 2 despite strong protests and opposition in the neighboring municipalities and from all over the country. The company just did it with the approval from the pro-nuke governor of Saga Prefecture (whose father worked for Kyushu Electric) and the NISA, saying there is no need for consent from the community (Mainichi Shinbun 11/2/2011) at all. The same vein of thinking as the petty bureaucrats in the Tokyo Metropolitan government. But back to the xenon/krypton detection in Reactor 2 of Fuku-I Nuke Plant, not all nuclear experts are convinced of spontaneous fission, particularly those not so intimately connected with the government. I am reading what they have to say, and will report back if I can digest. Maybe the news they wanted to cover up with a hasty declaration of re-criticality possibility and dismissal the very next day was the real re-criticality. Next time when xenon-135 is detected, no one will pay attention. "Oh it's just routine spontaneous fission, happens all the time." Tokyo Metropolitan Government Employees Tell Citizens Who Protest Against Disaster Debris: "There's Nothing You Can Do About It, Ha-ha"
or worse. One of them said to the caller, "It is a fate for children to accept radiation contamination." Here are three tweets by the citizens who called the Tokyo Metropolitan Bureau of Environment to protest against the disaster (and radioactive) debris from Iwate Prefecture, which is now being burned in that TEPCO's subsidiary on the landfill in Tokyo Bay. I present them as I found them on Twitter; I don't have reasons to suspect they are fake, but use your own judgment. From what I've heard directly from people who have called the Bureau or the national government's Ministry of the Environment in the past, this kind of response is all too typical. It does seem that the bureaucrats are very well trained under the governor who scolded the protesting Tokyo residents and told them to "shut up". Mr. Takahashi at Tokyo Metropolitan Bureau of Environment: Extremely combative. "We will continue to accept the debris no matter how many [protest] phone calls we receive." "It is a fate for children to accept radiation contamination." "You are just calling to file a claim." "I am talking to you only because it is [unfortunately] my job to do so." Abusive words, forgetting his position [as a public servant]. Mr. Nemoto of the Bureau of Environment was also terrible. He said, "There will be no ashes after burning the debris, you idiot. What are ashes, please? Tell me that." When I pointed out to him his overbearing manners, he replied, "Oh yeesss, I am sooo sorry. Yessir! I am answering very politely, aren't I? I am apologizing nooowww." I felt very sad at this depravity. Ms. Iwanaga of Tokyo Metropolitan Bureau of Environment was also bad. [She said] "Radioactive materials would disperse [by burning the debris] but it would be safe; there was no problem at all because it had been agreed and approved in the Metropolitan Assembly which represents the residents of Tokyo; there was no system whereby the residents have a direct say in the matter." To top it off, she hung up on me. I just couldn't do enough justice to the sheer rudeness of the second message, in translation. In his morning program on Fuji TV he's been promoting Fukushima produce by eating them in the show. He also happened to be in Fukushima in March 15. Just a coincidence. Never mind that ALL is predominant in small children, and an adult case is one in 100,000 annually in Japan. The 9-year-old daughter of the crown prince and princess was hospitalized for a few days for mycoplasma pneumonia (NHK News 11/5/2011). The empress has been ill with aches and pains in the arms and legs (Sankei Shinbun 10/12/2011). Now the emperor himself is being hospitalized for bronchitis (Mainichi Shinbun 11/6/2011). The daughter of the crown prince and princess spent her summer vacation in Nasu. (This link is also in English.) The Kan administration sent the emperor and empress in April and May to cheer up the quake/tsunami victims in Chiba, Ibaraki, Miyagi, Fukushima, Iwate, 7 weeks in a row. They ate food in Fukushima, and bring some home for their sons' families. The public park where 2770 becquerels/kg of radioactive cesium was found from the dried shiitake mushrooms, most of which had been fed to the public including 256 small children also grew rice in the rice paddies. The rice was found with 13 becquerels/kg of radioactive cesium. Oh such a minute amount, no effect on health! Start of yet another week where financial and political shenanigans in Europe will dominate the headlines. Greece's Papandreou (G-Pap, a la Zero Hedge) is being replaced by Lucas Papademos (L-Pap) as the prime minister, and the world tries to muddle through yet another week. L-Pap may have a better chance of muddling through, as he is a favorite of the US Federal Reserve. Well, he worked in the Federal Reserve Bank of Boston as a senior economist. Gold is going up in Asia. Gold spot at US$1771 (kitco.com).